It was that time of morning when the light holds back, not quite bold enough to sweep away all remnants of night but tantalizing just the same. 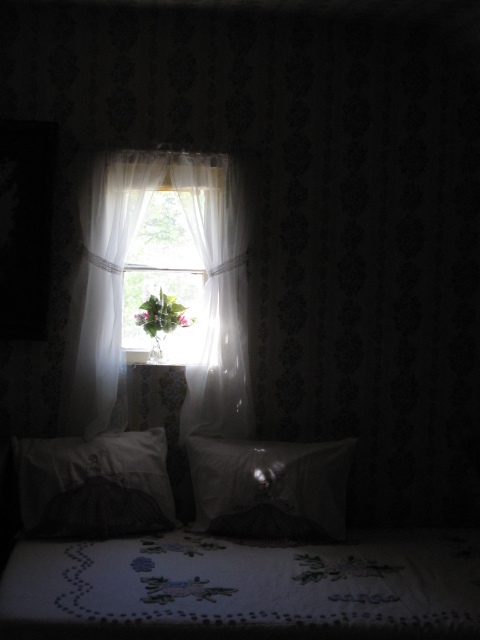 Delilah sat up in the narrow bed against the wall and leaned on the window sill. The birds were gossiping; she could tell by the way they volleyed tuneful chatter across the lawn. With a sigh, she let her eyes linger on the newly greened willow. She bolted out of bed. She had a couple of hours before she left for work at Hollywood Discount. Such a dreary place but it was a job and at this point in life she was lucky to have it, as her boss reminded her weekly. She splashed her face with cold water until it pinked up. The scent of coffee drifted up the stairs and brought a smile to her lined face. She turned on the shower. After she dressed, Delilah sat at the round table by the kitchen bay window with the daily paper in one hand, a mug in the other. Percival rubbed against her legs, silvery tail whipping the air with enthusiasm, his voice set on guttural purr. At fourteen he showed no signs of losing interest in the early mornings. “I would love nothing more than to stay home and catch up with you, Perci, but I aim to get that overtime. Your breakfast is in the mud room, as always.” Delilah wetted her fingertip and, turning the pages, scanned the news. She paused at the obituaries and ran her eyes down each column, then rose to get her toast and jam. Then she sank into her chair again as it registered. Jackson’s name–Jax to her–was on that page. But there he was: Jackson Malloy III. Former Air Force pilot turned VP in the medical supply business. Retired six months previous. Beloved father of three and grandfather of four. A woodworker of some local renown. Volunteer at the library and St. Stephens Children’s Hospital. Deceased 4/1/11 after a brief illness. She knew what it was: exhaustion, years of it. But they would call it something else. Percival protested from the mud room but Delilah sat with chin propped in her hands. It was two months ago when he had come in to the discount, looking for a cowboy shirt and marbles for his grandson as well as a hula hoop for his granddaughter. They’d exchanged easy words like always when they ran into each other. Just the way they did when they were teenagers, only now with fewer words but more said. “All those years of rat racing caught up with you, Jax” she said and patted his hand, which rested on the counter with a twenty in it. “Never too late,” Delilah said, and put his merchandise in the bag, then handed him the hula hoop. “You know how to use this, as I recall,” he said, chuckling. “I did and still do, I imagine.” She’d felt her face flame, she didn’t know why; it was decades ago when she had shown off her hula hoop tricks. He’d admitted that day was the start of something good. It went on ’til graduation from high school, then died of the neglect that time and distance creates. Jax handed her the hula hoop and gestured for her to prove her skills, which she did for a couple minutes until the thing clattered to the floor, hips swaying furiously, feet planted apart between a row of linens and one of glassware. He’d clapped; they’d had a good laugh over it. She tried to catch her breath and coughed a bit. She’d felt a whole body chill but Jax had smiled gently, whistling as he left. Perci leapt to her lap, but Delilah ignored him. She thought of the discount store, the long aisles of stuff that looked tarnished and sad to her when she opened the store each morning. She thought of her old comptroller job that took far more than it gave. And she let herself think of her daughter in New York, climbing fast and furious to the top of the heap where she could feel like someone important. And she thought of Jax whistling some happy tune as he’d left her standing among flimsy travel games, canned food specials, dollar cards and bargain books. Delilah didn’t think twice before she called in to the store. She rushed through the back door and got in the car, Percival jumping in beside her despite her protestation. 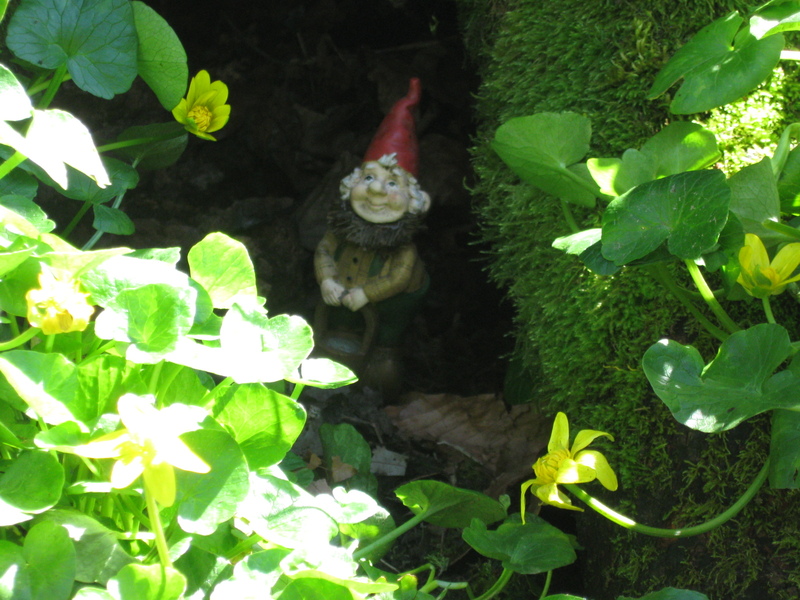 Fifteen minutes later she strolled into the corner park where the old big leaf maple tree stood among the swaths of marsh marigolds. The creek burbled behind her. The stone bench was still there. She sat while Percival chased squirrels, then leaned over to inspect the tree more closely. She thought she saw something in the hollow but couldn’t be sure. Kneeling down, she reached a hand into the shadows and felt around, shoving aside moldering leaves and sticks, then withdrew it, an object clutched tightly. “It’s still here,” she whispered as she turned the little statue over in her hands. It was a gnome-like figure, a round-bodied old lady with once-white hair and a big smile. It was worn and filthy, her face obscured by all the seasons that had come and gone over fifty years. She thought back to the day when Jax and she had found it in the park and put it in the tree hollow. “This is you when you’re old,” he’d said, then patted its head before placing it into the hollow of the tree. “A wise old lady we’ll visit when we’re ancient, too.” And then he’d surprised her with a kiss, so brief that it might not have happened except for the tingling and promise it left them. Delilah sat among the yellow blooms so long that Percival came over and rubbed his head against her feet. She dampened her shirt tail with creek water and polished the figure the best she could. The lady gnome looked good when placed just so in the tree opening; someone else might happen upon her now and wonder. Delilah let loose a few tears, then eased into the spring sunshine, face warmed by the veil of light. When all was said and done, it was still a fine morning. She knew Jax would agree.